Last month, ABIM was in the field listening to physician feedback on how to transform and improve the programs we offer to help determine what the future might look like for ABIM and its Maintenance of Certification (MOC) program. At the American College of Cardiology’s (ACC) 64th Annual Scientific Session and Expo, I participated in a panel discussion about the future of the MOC program. An engaging discussion between the panelists and the audience, the session focused on the changing world of medicine and how to effectively measure and determine the ongoing competency of cardiologists. Cardiologists’ opinions varied about ABIM’s role in measuring ongoing competency, and feedback indicated that the MOC exam for Cardiovascular Disease may not be relevant to practicing physicians. In addition, many physicians indicated that they believe they are already held responsible for “keeping up” by their peers, their patients and their employers, and that it is not ABIM’s role to be engaged in the ongoing assessment of their competency. A few weeks later, ABIM hosted a meeting with physicians and staff from more than 25 medical specialty societies. As part of the meeting, the room broke into smaller groups to discuss topics including our shared purpose of “keeping up” in medicine, how to achieve that, and our roles in doing so. Throughout, we heard a number of common themes regarding what it means for physicians to “stay current” and “maintain competence.” Then, we discussed and identified ways in which specialty societies can help ABIM by gathering feedback from their physician members during this listening process. 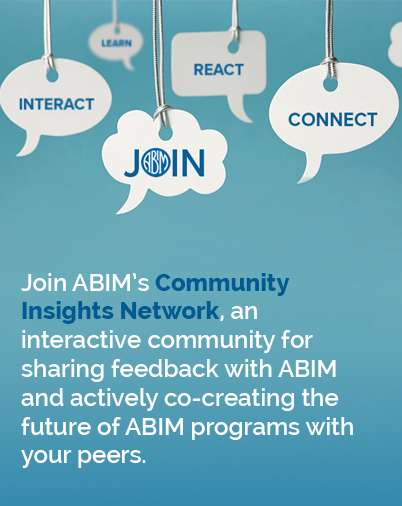 Participating in and creating opportunities to hear from physicians and the medical community continue to be a high priority for me and for ABIM going forward. I am determined to get it right, and we are dedicated to taking the time necessary for everyone to be given the opportunity to weigh in. We have more in-person meetings, events and workshops planned over the next few months for this purpose. We know many are anxious for us to “announce” the new details of the MOC program. We are a large and complex community, with many different voices, and we are convinced we can’t “get it right” by simply making decisions on our own. Rather, we are committed to serious engagement with this diverse community. We have heard loud and clear that doctors want to avoid redundancy and be recognized for the hard high value work they do. To be able to recognize and incorporate as many of these activities as we can, we need to continue to listen and learn, and that is going to take us some time. We are grateful to all who have provided feedback so far and want to encourage you to continue doing so. Please share your thoughts and ideas with me at rbaronmd@abim.org, or join us at meetings and conferences later this year. All the feedback we received will be heard, reviewed and seriously considered in our ongoing partnership with the community.